When I bought some gorgeous yarn in skeins, I finally broke down and got a ball winder and swift. I already had some yarn in skeins, and had even used some, making balls myself. But it takes longer, and time is short as I'm in the homestretch of a book. 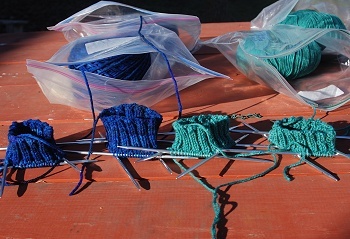 But I also have a lot of yarn bought as balls...and suddenly was faced with a beautiful blue-green (sort of rich aqua color) already in balls, and the gorgeous deep blue variegated, now in balls I had made myself (OK, with a ball winder and swift.) How could I resist starting...well...both? This is Cascade 200 Paints "Isle of Sky", a discontinued color. I have enough for five pairs of socks. Now that I've seen it in person, felt it, started knitting with it, I'd buy a lot more, but it's already off the menu at WEBS. Sigh. Cascade 220 Superwash, not (so far) a discontinued color, and also feels "lighter" than the other. No real hurry necessary here (you might not think there would be with the discontinued color, but...it's the one I really want to go with. Yummy yarns, both of them! But the sea green summerweight will wait just fine. I made my wife a pseudo-Inkle loom which worked, but wasn't rigid enough, so I bought her an actual one for Xmas '12. She hasn't knitted in a while. Amazon has some in stock. Pounce now if you want it, it looks gorgeous. Cascade 220 is a wonderful yarn. I'm currently knitting a sweater out of some (sadly discontinued) purple/blue. They call it "deep petunia". Check out WEBS www.yarn.com -- they had a huge sale on discontinued Cascade 220 and might have some left. Gorgeous colours! I especially love the aqua Superwash. I say semi-simultaneously, because you'll finish all the socks you just started without having to pick favourites. Plus it's a fun word. Go with your heart. Really, I've found that with any creative effort, if I put off what I REALLY want to do in order to finish something else first, both may come out well, but if I go with my heart, one comes out well, and the one I really wanted to do comes out beautifully. That Isle of Sky is gorgeous! It makes my heart sing, really. Now that I'm on the heel flaps I like it even more. It doesn't self-stripe like sock yarns designed for that, but I like the randomness of the lighter parts--like light on water. 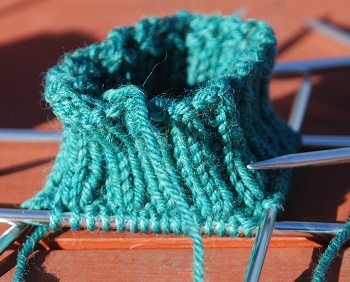 The Isle of Sky socks are past the 5 inch ribbing and onto the short stockinette section before the heel flap. I should finish that section tonight, if I get enough more words done on the book. 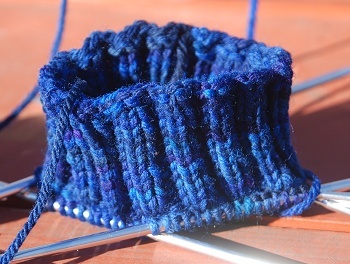 Then the heel flaps. Then the gussets. Then the feet. Then the toes. Alas, I have lots of other things to work on this week that must be done. Hope that the storm craziness has been fairly tame where you are.